(Bass Method). The Hal Leonard Blues Bass Method is your complete guide to learning blues bass. 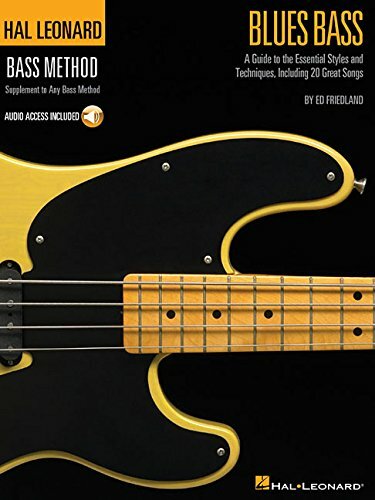 This book with online audio uses classic blues songs and standards to teach you how to lay down your own solid blues bass lines. Learn to play by studying the songs of famous bluesmen such as B.B. King, Stevie Ray Vaughan (Tommy Lee Shannon), Muddy Waters, Freddie King, Albert King, The Allman Brothers, Otis Rush, T-Bone Walker, Louis Jordan, and many more. Learn actual riffs from blues classics including: Born Under a Bad Sign * Hideaway * Hoochie Coochie Man * Killing Floor * Pride and Joy * Sweet Home Chicago * The Thrill Is Gone * and more. Audio is accessed online for download or streaming and includes PLAYBACK+ tools that enable you to adjust the tempo without changing pitch, loop passages, and more. A complete guide to mastering the techniques and stylistic details of the Blues Bass Guitar, using classic blues songs and standards to get you playing in the right way, straight away. Learn to lay down solid basslines for straight blues, shuffles and other important variations. You will discover a host of songs by the kings of the blues, including Muddy Waters, Freddie King, Otish Rush and The Allman Brothers, by getting to grips with the actual riffs used on the original recordings. Song include Born Under A Bad Sign, Hoochie Coochie Man, Pride And Joy and Sweet Home Chicago.